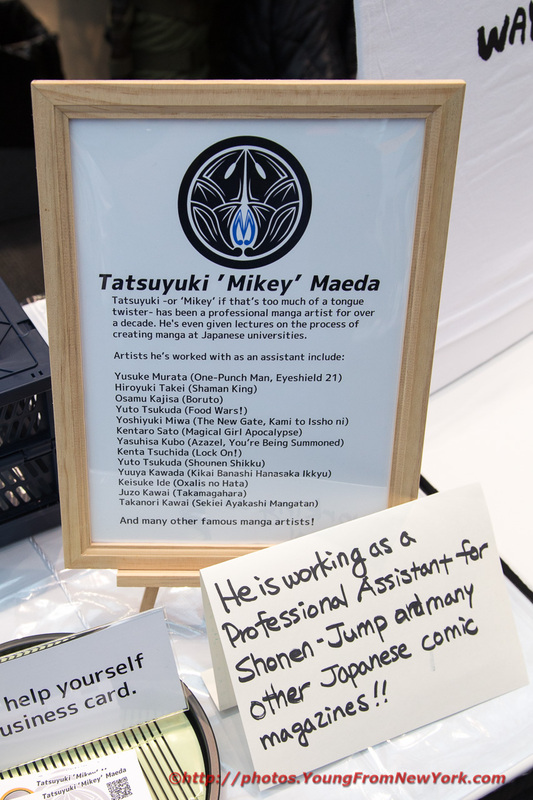 Tatsuyuki "Mikey" Maeda is a professional manga artist of 10 years and has assisted on titles such as One-Punch Man, Shaman King, Boruto, Magical Girl Apocalypse, and many more. What initially attracted me to his booth was his arsenal of drawing utensils (which these days consist of a computer and tablet) - but then immediately discovered he spoke no English. On the table, was a booklet that promised to show me the Secrets of Manga, Basics of Tools and the Trade and I knew the contents would be worth more than the asking price. That was a special print for this event. YJ: Please tell me about Mikey. YJ: He's an artist; he draws, right? Saiya: Yes, of course! A comic [book] artist. He's working with Yusuke Murata who does One Punch Man, or [on] Shaman King... so many. What he brought today is a book for the really basic things - how to draw manga. 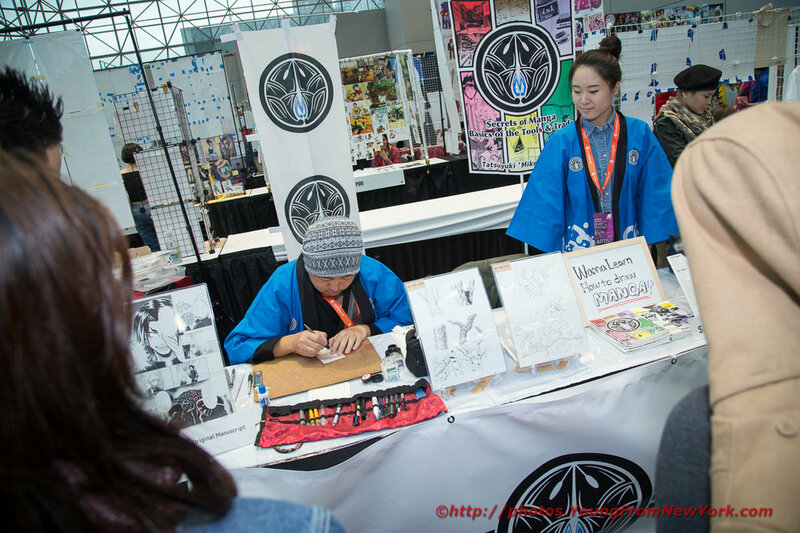 It's like a really mysterious area - we all know comics, but we don't necessarily know things like what [kind] of pens, or inks or paper [you need] - everything about comics is in there. If you're really interested in drawing or even if you're not an artist, but have an interest in comics and anime, you really gotta have this one. It's got everything - super recommended. YJ: How long has he been an artist? Saiya: Like over ten years. YJ: How long has he been an artist before doing it professionally? When did he start drawing? Saiya: He was in an institute for the arts and was teaching comics there. But he wasn't [working as a professional] artist, he was teaching. After turning 26, he started working as an artist. So it's been ten years since then. Saiya: yes, for a very famous manga artist. He couldn't leave Wednesday from Japan so he had to leave on Thursday which is why he couldn't attend Friday. So this is his first day here (Saturday). YJ: So he can only be here for a few days at a time... he can't leave because he's always busy drawing. YJ: So he can be away for no more than how many days? Saiya: Three days at a time. YJ: So we're very fortunate to have him here. Saiya: Yes, very. The reason why he's here is because he has passion to teach a global audience how to draw manga from the point of view of a professional manga assistant. The thing is, he doesn't speak English, so he made this comic and got it translated so English speakers can read it and learn how to draw manga. YJ: Where is he based? Saiya: He lives in Saitama [like New York city's non-Manhattan boroughs], but he works with many comic artists so he's basically in the Tokyo area. YJ: Does he like to draw specific things? What does he personally like to draw? Saiya: He's really into the effect lines. YJ: And by effects, you mean things like movements, bangs (noises) and effects of things that happens. Saiya: He is in the... it's not really a company, but he's the artist doing specifically this [kind of work]. As he's has been trained in doing these kinds of effect lines, he's really good at it - so he likes it. YJ: For people who are interested in picking up this book outside of the convention, is there a place where they can buy it or is there a website or instagram or something where they can find him? Saiya: Not a [physical] book, but in a digital book format for Kindle after this [convention] on Amazon. So far he's just thinking about it, but maybe in the future. Saiya: He has Twitter, Instagram and Facebook pages. And he also has his own Youtube channel called "Doki Doki Drawing", so you can search for it there.